Американский праздник День благодарения (официальный праздник США в память первых колонистов Массачусетса) в этом году отмечается 22 ноября. В русскоговорящих странах немного знают об этом наиболее популярном в США празднике. Поэтому я решила опубликовать коротенькую информацию о нем. Познакомьтесь с нижеследующим текстом, используя словарик в конце его, прочитайте текст несколько раз громко вслух и ответьте на вопросы предлагаемого теста. Результаты теста покажут, на сколько хорошо Вы поняли историю происхождения этого праздника. Thanksgiving is one of the most popular holidays in the United States of America. Traditionally, Thanksgiving is a holiday that Americans spend together with their families who enjoy a Thanksgiving meal which usually includes the traditional Thanksgiving turkey. Below is the story of Thanksgiving. Once you have read the story, take a comprehension quiz to check your understanding of the text. 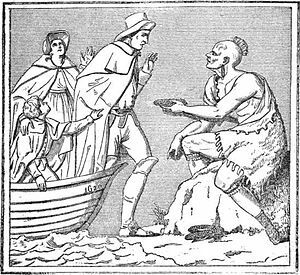 The Pilgrims suffered from religious persecution in their native England. 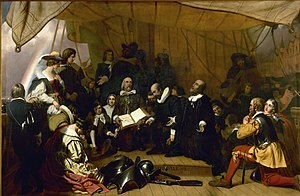 Thereafter in 1609 a group of Pilgrims left England for the religious freedom in Holland where they lived and prospered. After a few years their children had become attached to the Dutch way of life. This worried the Pilgrims who considered the Dutch frivolous and their ideas a threat to their children’s education and morality. So they decided to leave Holland and travel to the New World. Their trip was financed by a group of English investors. It was agreed that the Pilgrims would be given passage and supplies in exchange for their working for their backers for 7 years. On Sept. 6, 1620 the Pilgrims started their travel to the New World on a ship called the Mayflower. They sailed from Plymouth, England. 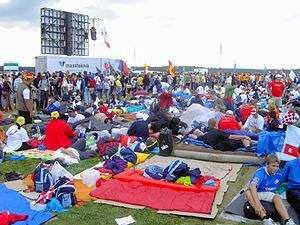 110 Pilgrims were aboard. The long trip was cold and damp and took 65 days. Since there was the danger of fire on the wooden ship, the food had to be eaten cold. Many passengers became sick and one person died by the time land was sighted on November 10th. It was Massachusetts. The Pilgrims did not settle until they arrived at Plymouth, which had been named by Captain John Smith in 1614. Plymouth offered an excellent harbor. A large brook offered a resource for fish. Thus the Pilgrims decided to settle there. The first winter was devastating to the Pilgrims. The cold, snow and sleet was exceptionally heavy. March brought warmer weather and the health of the Pilgrims improved, but many had died during the long winter. Of the 110 Pilgrims and crew who left England, less that 50 survived the first winter. On March 16, 1621 an Indian brave walked into the Pilgrims´ settlement. His name was Samoset. He had learned English from the captains of fishing boats that had sailed off the coast. After staying the night Samoset left the next day. He soon returned with another Indian named Squanto who spoke better English than Samoset as Squanto had learned the language in England. Squanto’s importance to the Pilgrims was enormous. It was Squanto who taught the Pilgrims how to tap the maple trees for sap. He taught them which plants were poisonous and which had medicinal powers. He taught them how to plant the Indian corn by heaping the earth into low mounds with several seeds and fish in each mound. The decaying fish fertilized the corn. He also taught them to plant other crops with the corn. 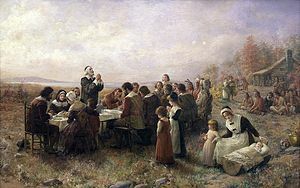 The harvest in October was very successful and the Pilgrims found themselves with enough food to put away for the winter. There was corn, fruits and vegetables, fish to be packed in salt, and meat to be cured over smoky fires. The Pilgrims had much to celebrate, they had built homes in the wilderness, they had raised enough crops to keep them alive during the long coming winter, they were at peace with their Indian neighbours. It was time to celebrate. The Pilgrims invited Squanto and the other Indians to join them in their celebration. Their chief, Massasoit, and 90 braves came to the celebration which lasted for 3 days. They played games, ran races, marched and played drums. The 3rd year brought a spring and summer that was hot and dry with the crops dying in the fields. Governor Bradford ordered a day of fasting and prayer. Soon after that the rain came. To celebrate — November 29th of that year was proclaimed a Day of Thanksgiving. This date is believed to be the real true beginning of the present Day of Thanksgiving. The custom of an annually celebration of thanksgiving, held after the harvest, continued through the years. In 1863 President Abraham Lincoln appointed a national day of thanksgiving. Since then each president has issued a Thanksgiving Day proclamation, usually designating the fourth Thursday of each November as the holiday. Now check how you have understood the text by taking Thanksgiving reading comprehension quiz. cured копченый, вяленый; засоленный; консервированный; (u)sušit, nasolit, konzervovat např. potraviny ap. Pilgrim пилигрим; паломник; колонист; приезжий; первый поселенец poutník na svatá místa ap. AT / IN / ON – Какой предлог выбрать?